If you’ve ever wondered what it’s like to be in solitary confinement and imprisoned without human contact, just ask a robber, murderer, or freelance writer. Solitary confinement, colloquially referred to as the “hole,” “lockdown,” or in my case, “home office” can be a torture like no other and lead to such severe behavior as withdrawal, paranoia and uncontrollable snacking. Tommy Silverstein, who has been in solitary confinement for the past 29 years, longer than anyone else in the federal prison system, describes solitary existence as “a slow, constant peeling of the skin.” Additionally, he reportedly suffers a terrible addiction to Pringles. Unlike Tommy, I am not held against my will, but I do work in constant isolation and experience a similar lack of human contact and sensory deprivation that has caused me to become disturbed, agitated, and acutely aware of my neighbor’s bathroom habits. For instance, through my bird’s eye view from my office, I know that Mrs. Sanchez routinely rises at six-thirty to retrieve the newspaper. Within fifteen minutes she has poured herself a cup of coffee and headed to her outpost. By half past seven she has sipped, skimmed, and flushed. Mr. Sanchez has his own routine, which unfortunately includes every Saturday blowing his leaves out of his yard and onto mine. His sunflowers have grown so tall they impede my view into his kitchen and I often fantasize about how I might lean over the fence and rip them out the same way Mrs. Sanchez leans over the sink to remove her dentures. Pausing to give my arm a rest, I nodded in agreement. Through a mouthful of Pringles, I mumbled, “I’ll try, Señor Sanchez,” and offered him a chip. I invited to lunch everyone that ever visited my house—the garbage collector, the meter reader and the UPS guy. The garbage man, Leo, didn’t mind that I served only Pringles. He seemed grateful to be there and even left with my garbage. The UPS guy, Bill, didn’t seem as appreciative. He dressed in plain brown and didn’t bring a hostess gift. “Couldn’t you at least deliver me flowers?” I asked Bill. “That’s the FTD guy,” he answered, shoveling Pringles into his mouth. He rushed off claiming he had another package to deliver. Whatever. At that point I gave up on the lunch invitation, deciding instead to focus on the upside of isolation—heightened creativity. I’ve done some of my best work confined to my office like a caged animal, with nothing but Señor Sanchez and Pringles for company. I hope to one day complete my life’s work, a collection of essays on the relationship between writing and voodoo-ism, titled, “Writing Beyond Reality” and die a martyr to my keyboard, despite years of nagging loneliness and an obscured view into the Sanchez home. Eventually, Leo, Bill or Frank will discover me dead, slumped over my desk, hugging my manuscript to my chest. I enjoyed your post. Writing is a vicious cycle. We need solitude to write, but we need other humans to provide us with material. My family with often martyr themselves for my cause. Thanks. And good point. We do need others for fodder and inspiration. Pringles, meters, Senor Sanchez and voodism are all but ways to lead to my Monday dose of laughter. Your writing shows you must be around people all the time, not otherwise. Such humor comes from a very social person. Ha! So many of us share the same commute, we should carpool! Well done. I giggled often. I plan to make my very own voodoo doll. Why haven’t I thought of that on my own, I have no idea. Thank you! Well. I sure as heck know WHO it would look like. I’ll get my sewing kit out later tonight! mwahahaha. I’m waiting with bated breath. True. But I couldn’t stand the solitude any longer so I headed to Panera. Now I’m spying on strangers. But I’m still lonely. Solitary confinement, yes, and yes. I made a trip to the forest over the w/e. That silence is invigorating, quite unlike the vague hum of my CPU. Love the bits about neighbors and so on. I watch the comings and goings and make up stories from them. Hmmmm, blog worthy? Do you think she had a voodoo doll? Society deserves two of us. Stocking Pringles as we speak, scouting around for a Frank, Bill, Leo…Craig’s List perhaps?? One upped you on Senor Sanchez, however, I have a magic wand…. It’s a plan! But I want a magic wand too! I’ll check Craig’s list. The art gallery I do research for…get this…has a magic wand maker!!! They are for real. Really! Graham carves them from exotic woods. Beautiful. If I can find his website…I’ll pass it along. You’ll be impressed. I’d save Craig’s List for “other things”…. On the “notes” check out the photos…click on each photo for bigger image. Graham is also Assistant Principal French Horn player for Oregon Symphony Orchestra. It’s a date! Señor Sanchez wants to know if he’s invited. Brillant, I too am addicted to Pringles. You should come hang out with me. I’m printing this one out, Mrs. Muse, and it will be posted on my office wall. Ok, so I couldn’t help it, you needed to spell meter for poetry as metre but who the hell cares about the way the French spell things anyway? Wall-worthy? I’m honored! And oui oui, madame, you are correct– I corrected meter to “metre.” I beg you, come back to writing group! So sorry…I had no idea. See what happens when you move away? You should be comforted by the fact that soon the sunflowers will be dead and you unobstructed view of your neighbors’ kitchen will return. Too bad the FTD florist didn’t have a delivery for you too. You could have invited him for some champagne and Pringles to go with the flowers. Right! Or, I could have invited the Edible Arrangements guy. Then I would have enjoyed a delivery and a free lunch. Next I’ll be watching The Birds. Solitary confinement was a lot more productive before the internet, twitter and Facebook…but I like the Pringles idea. My observation is the same as “rebecca2000,” your outlook on life and your neighbors is much like “Rear Window.” But it also sounds like my self-imposed seclusion over the summer. 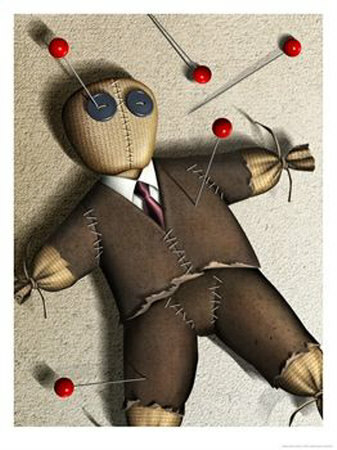 Good call on having a voodoo doll to take out your frustrations on. My choice also would have been an unreceptive agent. You’ve provided many vicarious thrills and chuckles, Lisa. I suppose we are fortunate that our seclusion is self-imposed. I always enjoy your comments. Thanks to you, I’ve learned you can request (and become addicted to) Pringles in solitary confinement. I’d personally ask for Nutella, although after 29 years, I might get sick of it and have it only every other day. I hear you about writing and being alone to write. You really can’t write well with distractions around you, and that includes other people. But you also draw believable stories from mingling with other people, so it’s a tough balance. I’m not always crazy about having to write for various companies but at the same time, it guarantees human interaction on a regular basis. Alright, interacting with some people can drive me nuts and I may be better off not dealing with them! You’re right, we do draw from our surroundings so it’s good to be aware. Speaking of which, isn’t that a new photo? Nice. Thanks! It’s “new” as of a couple of years ago but I swear, I haven’t changed much (except for more gray hair to cover). Thank you for your comment. I appreciate your thoughtful and tactful response. Your point is well taken. As a humor writer I often use exaggeration to add humor to common place examples. You make an important distinction with respect to semantics and situation. Solitary confinement is a serious issue and I can understand how you were hurt by my references. I regret any pain I may have caused you or anyone else. Please know that was not my intention. I thank you for shedding light on this topic. I love writing. I could write 24 hours a day–except for that pesky sleep affair–and sometimes, I have. I do have the most wonderful sweetheart in the world, however, who has been with me–my constant companion for the better part of a century. We have private spaces, but most of the time, we share a room wherein we have matching desks. I prefer that, I think to locking myself up in my study. I just put on my headphones and turn on this marvelous program called “natura,” by a company called opticalsweets.com which makes all kinds of rain and surf and thunder and lightening sounds, which you can mix to your liking. I guess I’m not really isolated, like the Pringle eating inmate. One wonders why someone would be placed in solitary for that long. Is it because he is in danger from the general population? Or because they are in danger from him? I’ve never heard of this man, and I’m too engaged in several projects right at the moment to run a search on it. I just wanted to say I enjoyed your site, make a quick comment, and get back to work. Thanks again for the visit. Thanks for commenting, David. I think it’s beautiful that you and your sweetheart share a work space and that you work together, separately. “Natura” sounds cool, I intend to check it out. I’ve “officed” @ home for 15 years. I just realized knowing way too much about everyone at the Post office, grocery store, nail salon & starbucks is a result of me being in in the hole for most of the day and has nothing to do with being the nicest person ever. I don’t need an alarm clock to get my fanny out of bed in the morning…each morning as my neighbor blows “a farmer” in the shower, I know it is time to go to work! I must admit, I had never heard that expression before and when I looked it up I laughed out loud. That’s some neighbor you have! I think I’d rather be awakened by a rooster’s crow . . .
Good for you for being disciplined about your writing. I think the isolation comes with the territory. I thought to myself, kid, you are SO going to grow up to be me. There are not a few days when I’d happily take your solitude, but I suppose it would get old even to me after a while. This is terrific, as usual, Lisa! It should only be that simple . . .
It’s great to know there are other people out there, spending way too much time on their own and knowing more about their neighbours than those people they used to be friends with. You’ve inspired me to make sure that I get out tonight! I can relate in so many ways. My biggest adjustment to going to an office again was withdrawal from my pantry. I used to make fun of my mom when she said the butcher’s at the grocery store would compliment her on her appearance. When you are at home, they become your water cooler. Very funny about inviting all the people who knock on your door to lunch.